The official portrait of former Gov. Tim Pawlenty will be unveiled at the State Capitol on Oct. 10. The portrait, by artist Ross Rossin, will be hung on the Capitol’s ground floor, near portraits of other recent governors Jesse Ventura, Arne Carlson and Rudy Perpich. 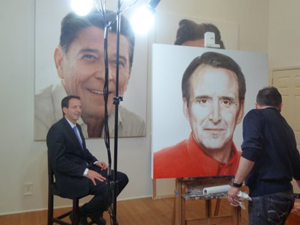 Rossin was commissioned to paint the official portraits of both former Presidents George H. and George W. Bush, which hang in the presidential library in Texas. Pawlenty and members of his family will be joined by friends and members of his administration for the invitation-only event, which begins at 7 p.m. The framed portrait will take its place with those of 38 previous governors.